Cleveland welcomed home one of its young heroes on Saturday. 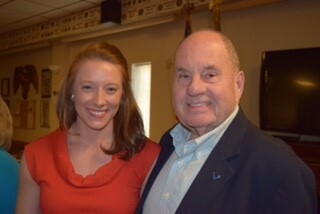 Family, friends and community leaders cheered 1st Lieutenant Kaylee Marie Radzyminski at a reception held at American Legion Post 81. Lieutenant Radzyminski is visiting Cleveland after serving in Afghanistan and Iraq. She is a graduate of Cleveland High School where she started an organization called Tunes 4 The Troops. She enlisted local volunteers to collect and ship used CDs, DVDs and games to American troops in battle zones. More than 1.2 million items were sent to the troops. She received national media attention and was recognized as a CNN Hero. Lieutenant Radzyminski is also a Tennessee Tech ROTC graduate where she was commissioned as a 2nd Lieutenant. She shared stories of her recent service in Mosul, Iraq with those greeting her. Cleveland Mayor Tom Rowland, Bradley County Mayor D. Gary Davis, state Senator Mike Bell, Circuit Court Clerk Gayla Miller, American Legion Post 81 members and American Legion Post 81 Ladies Auxillary and many others were on hand to greet Lt. - soon to be Captain - Radzyminski.